Would you like some lockjaw with your jewelry? I’m really, really trying not to turn this blog into a Regretsy clone. But some of this stuff is just SO bad that I have to share it with all of you. These darlings showed up in an email titled: Etsy Finds: In the Mood‏. I have no idea what mood they’re talking about, but my first thought when I saw these was tetanus. Tetanus anyone? Lockjaw? Is there really a difference? 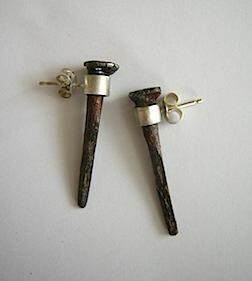 That’s right, folks, those are rusty barn nails with sterling silver ear posts. They could have been yours for the wee sum of $42.00, but someone actually bought them today. So, sorry, you missed out. On lockjaw. If you really want something like them I’m sure I can make some rusty fish hooks into earrings or a necklace for you. Just let me know. Next Next post: All wedding stuff all the time!!! And squirrels.